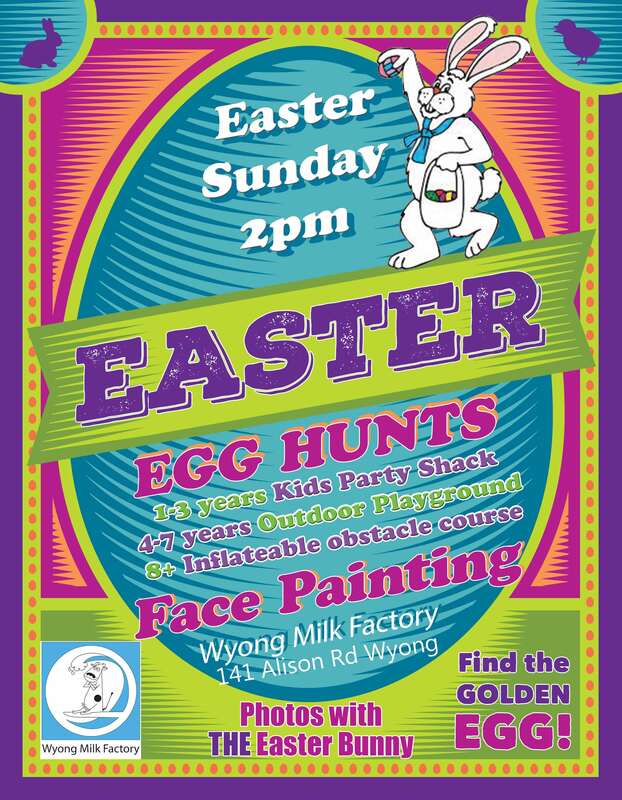 Easter is fast approaching and what better way to spend it than an afternoon at Wyong Milk Factory! From 2pm on Easter Sunday we will be running a series of egg hunts in 3 different locations around Wyong Milk Factory to ensure that all of those little egg hunters get a fair go at finding some chocolate goodies! We will also have face painting, more jumping castles and a visit from Mr Easter Bunny himself! On Easter Sunday in The Rusty Udder Bar we have the fabulous Bec Pap performing live from 12.30pm giving you some wonderful Sunday tunes to chill out to on your Easter long weekend. If you are wanting to enjoy a delicious lunch in Wyong Milk Factory Tavern we would highly recommend reserving yourself a table to ensure you and your guests have a wonderful effortless afternoon with us. For all inquiries phone 4353 0462.